﻿Sylvia Bergstrom has been a top producing agent since starting real estate in 1973, and Marin Hagen joined her mother’s successful real estate practice in 2007. They count among their clients Presidential candidates, Senators, Members of Congress, Cabinet secretaries, governors, leaders in the arts, medical, business, legal, non-profit and many more. Their business is nearly 100% repeat and referral, a testament to their high ethical standards, strong negotiating skills, energy and discretion. Sylvia and Marin consistently rank among the top 5 Coldwell Banker teams in the Mid-Atlantic region, among more than 2,078 sales associates in 30 offices. 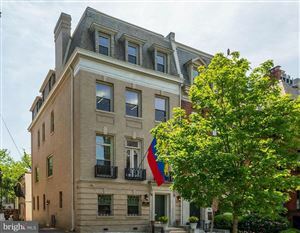 DC’s Kalorama neighborhood, home to both Sylvia and Marin; historic and “one & only” properties; luxury homes, condos, co-ops and everything in between, priced from $200,000 to $22,000,000. Coldwell Banker International President’s Elite. “Realtor of the Year” (Sylvia) and lifetime Top Producers (Sylvia and Marin). Marin and Sylvia regularly donate substantially to over 20 local and national charitable and cultural organizations.